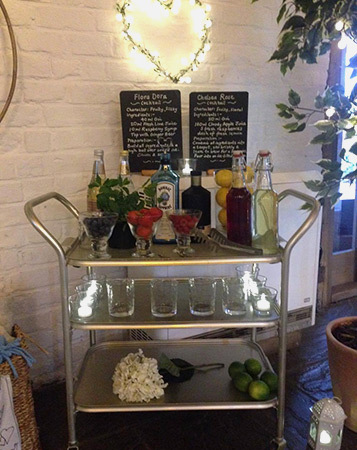 Our cool cocktail bar trolley can be tailor-made to suit any of your favourite tipples but is very popular for a gin bar, rum bar or prosecco bar! 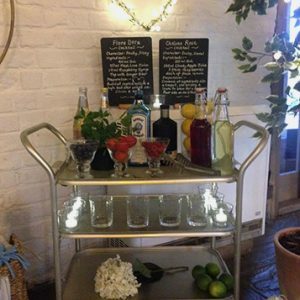 Add your own alcohol, accompaniments and cocktail glasses and we’ll provide the trolley with all the tools you need to mix your cocktails including recipe boards, mixing jugs, measuring cups, stirrers, and bowls. Lots of different styles available and decor trimmings to suit the style you’re after. Great fun for your guests!